Let Us Change Your Flat Tire For You! We Can Jump Start Your Battery In A Jiffy! Locked Out Of Your Car? We're Faster And Cheaper Than A Locksmith! Are you in need of a quick, inexpensive towing service in San Tan Valley? Of course you are, otherwise you wouldn't be here. Maybe your car is broken down, or perhaps you've got a classic car that you need moved from your home in Queen Creek to the Barrett-Jackson Auction up in Scottsdale. Whatever the case, contacting San Tan Towing Pros should be the one and only phone call you make. You see, the thing is... We take customer service and professionalism to a whole new level. Our goal is to alleviate the stress you may be under due to unforeseen automobile trouble. We're so much more than a group of guys that move cars and trucks from A to B. Smiles, laughs, and occasional hugs are all included in our roadside service-- at no extra charge. Check out a comprehensive list and description of our services. Give us a shout today to see firsthand what makes us better than all the other towing companies in San Tan Valley, AZ. At San Tan Towing Pros, we believe in keeping a culture that reflects compassion and integrity in all that we do. You'll never be charged a higher price than what we quote you over the phone, and when the job is completed, you'll know that we're truly concerned about you and your vehicle. Our experience and expertise in handling various vehicle loading situations will be evident, but we also want you to know that we really care about our neighbors in the Phoenix metro area's Southeastern suburbs. Our mission here is to provide the absolute best in towing and roadside aid. So go ahead and contact us-- you won't regret it. Usually, the need for a tow truck is an unexpected one. It starts with a clunking noise that you know isn't good, or the all-too-familiar "thump, thump, thump" of a flat tire. After pulling over to the side of the road, the last thing you want to do is spend your hard-earned money. Chances are though, at some point during the thousands and thousands of miles you'll drive to and from work, home, and the golf course, you'll need the services of a local tow company. When that time does come, it's important that you hire an experienced operator who uses industry-standard methods and professional equipment to ensure the safety of both you and your vehicle. It's estimated that 70% of Americans don't even know that they are supposed to move over when passing by a vehicle that is parked on the shoulder of the roadway. That means you're in more danger than you thought when you are stranded in a broken down car, waiting for a tow truck to arrive. Even if it's a simple battery jump start that you need, make sure to be extra cautious when exiting your vehicle, and don't do so unless your car, truck, or SUV is far away from the flow of traffic. Crashes and collisions happen each and every day. We truly hope it never happens to you, but if you've found yourself in circumstances that require a skilled car accident recovery technician, please don't hesitate to give us a call. Day or night, we have the capabilities to remove your ride from the road safely and efficiently. Kids don't just say the darnedest things, they also do the darnedest things-- like lock your keys in the car. Heck, maybe you're the clumsy goober that locked yourself out of the vehicle or lost the key. Regardless of who's to blame, we can help get you back in there in record time. Most people don't realize that a local tow service often has the means to unlock your automobile much faster and for less money than a locksmith will charge you. If you're suffering and need a car lockout service for your car, truck, or SUV, give us a call. San Tan Valley, Queen Creek, Mesa, Chandler Heights, Gold Canyon, Gilbert, Higley, Apache Junction, Chandler, Sacaton, Valley Farms, and Coolidge, AZ. 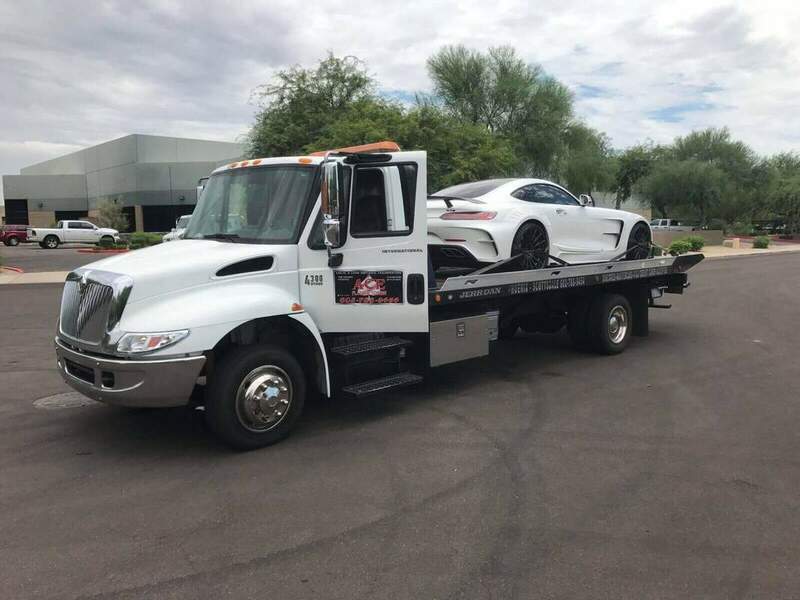 If you made it this far down the page, you either love the way we write, or you are pretty serious about finding the absolute best towing company in San Tan Valley to help you out. Well we've got some good news for you-- you found us. There is nobody better equipped to handle your need for a quality, local wrecker service. If you need to... read more about us. If you're convinced we're the best -- which we are -- go ahead and make the call. We'll be there ASAP to take care of you.